I will be listing a large quantity of toys over the next few weeks. 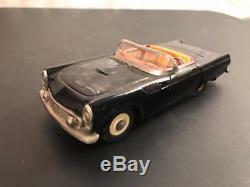 Very nice Bandai of Japan 7 long tin friction Ford Thunderbird. Marked MADE IN JAPAN along with the Bandai logo on the underside. Has a wonderful lithographed tin dashboard and seats with tin steering wheel (the steering wheel is loose as the tabs to hold it to the dashboard have broken off the back). Features beautifully painted body with nice chrome grille and bumpers. Has all of the tin hubcaps on rubber tires. The friction still works well and the plastic in the window is complete. CONDITION: The friction still works well and the chrome has very little tarnishing. There is some very light scratching as shown, more to the underside. The tin steering wheel is loose due to broken tabs as mentioned above. Get Supersized Images & Free Image Hosting. Attention Sellers - Get Templates Image Hosting, Scheduling at Auctiva. The item "1950's Bandai Japan Tin Friction Toy Thunderbird T-Bird Convertible Car" is in sale since Monday, April 02, 2018. This item is in the category "Toys & Hobbies\Vintage & Antique Toys\Tin\Vehicles". The seller is "treasuresof-yesterday" and is located in Webster, New York. This item can be shipped worldwide.